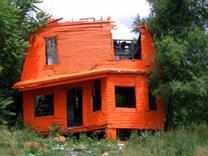 we make money not art: Detroit. Demolition. Disneyland. Calling the first WikiWednesday - S.E. Michigan style. 9pm - 11pm at Leopold Bros.
We sent an email to their self through mail, it shows in gmail, but doesn't get downloaded back to mail. Any thoughts? Also, does anyone have words of advice on forwarding through sbcglobal.net, is it slow? The photo of Rod Coronado originally appeared in the September 2003 issue of Zenger's News magazine with the following caption, "At his August 1 lecture in Hillcrest, Rod Coronado used this apple-juice jug and non-lethal fluid to demonstrate how he made incendiary devices in the 1990’s." TLAXCALA, The Translators’ Network for Linguistic Diversity. Tlaxcala's Manifesto. On this day of remembrance we put Tlaxcala under the patronage of those two fighters for the struggle of peoples, Missak Manouchian and Malcolm X.
Judi Werthein has designed a special "crossing trainer" to help illegal immigrants cross the border from Mexico to the US. 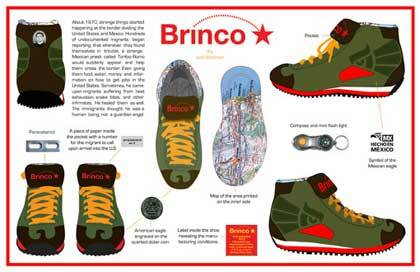 The shoes are named Brincos for the Spanish verb "brincar," which means "to jump" —as in, across the border. They includes a compass, a flashlight because people cross at night. The pocket in the tongue hides money or some Tylenol painkillers because many people get injured during crossing. Why oh why don't we have a calendar for labor in this area? It is with great sorrow that the Family and Friends of J Dilla announces his spiritual transition on the morning of February 10th, 2006 in the loving arms of his mother, Maureen Yancey. J Dilla had suffered for over three years with an incurable blood disease, and had also been diagnosed with lupus. Get a free wiki at PBwiki.com. In 1992, a group of community activists coming out of the organization Save Our Sons and Daughters began organizing against the idea that casino gambling could save Detroit. At that time, the city was reeling amidst a shattered economy, crack ravaging the neighborhoods and an epidemic of youth on youth violence in the streets. Then mayor Coleman A. Young challenged the anti-gambling activists to go beyond merely protesting the construction of casinos and to answer the question: if not casinos, what kind of development could save our city? Detroit Summer was created as an experiment in answering that question. If given the opportunity, could young people transform their communities and themselves at the same time, through projects such as urban gardening, mural painting, house rehabilitation, block parties, and community dialogue? It's wednesday, and day 3 of a strike of the staff [and some students] at University of Kwa-Zulu Natal, where the Centre for Civil Society has its home. "FREE UKZN", "WE DEMAND ACADEMIC FREEDOM", "NEGOTIATION IS A RIGHT"... just some of the great slogans on union t-shirts today. This is a friend's project. Tomomi is a person that brought focus on international students within GEO, the Graduate Employees Organization at U of M before I worked there. On the US tour of a Japanese documentary film by Yamagami Chieko and Seyama Noriko, "Thirty Years of Sisterhood: Women of the 1970s Women's Liberation Movement in Japan" in Feb. 2006. The screening of the film, as well as the panel discussion with the directors and feminists featured in the film, will be held in the following university campuses and community locations in Feb, 2006. This article in ASR was called “How to find your local Wobbly history” by Robert Helms. The gist was this: go to a good library, preferably a university one. Get some books on the IWW. Look up your town in the index. Write down: dates, companies where agitation was happening, any names. Then go to the public library, look at old newspapers on microfiche, look for the day after the dates you wrote down previously. You will likely find detailed reports of events that know one alive knows about, including names of participants and addresses of events. Then go check out these addresses. Helms said he went to several old union hall sites, and two were still standing. In one, the current occupants had found some old handbills in the basement, and had them framed on the wall. Very cool stuff. The strange world we live in. The all encompassing presence of technology that was in science fiction I read as a child is here, and not in much less outlandish ways than the fiction had it. Analog wiki, open space values.